Most people have two kidneys. 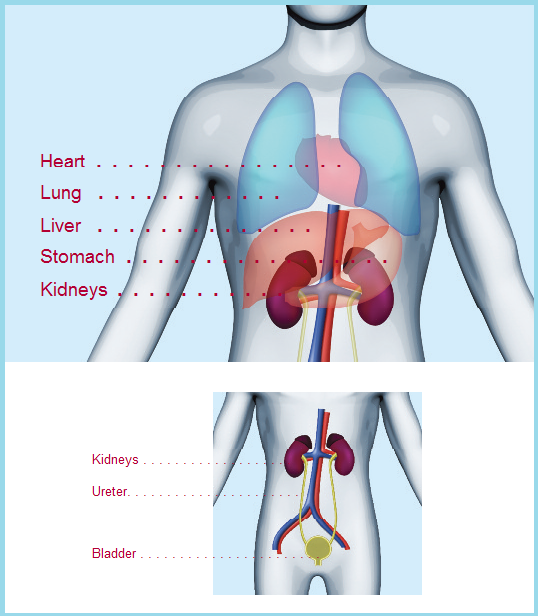 The diagram shows where your kidneys are in relation to your other major organs. The kidneys are bean-shaped organs, each about the size of a fist. They are just below your ribcage, one on either side of your spine, at the back of the body. Every day the kidneys filter about 200 litres of fluid, removing 2 to 3 litres (more than 3 to 5 pints) of water and waste products from the blood. If the kidneys did not remove them, these wastes would build up in the blood and damage the body. Blood is moved through the kidneys in blood vessels. Tiny filters within the kidneys act like a sieve. They keep proteins and cells in the blood where they are needed. Extra fluid and waste is passed to the bladder in urine. The bladder stores urine until you go to the toilet. The kidneys also produce a hormone called erythropoietin, which is needed to make red blood cells. Healthy kidneys help keep your blood pressure stable. And kidneys are important for absorbing the right amount of calcium and phosphate, which helps keep your bones strong.